AI (artificial intelligence) seems to be taking the world of Human Resources and Recruitment by a storm. Previous years have seen countless different articles and blog posts covering AI. On top of that, more and more recruitment software seems to make use of AI in some form or another. It’s safe to say, AI in HR and Recruiting can be seen as the most present trend to dominate the space in the next years. 2 The advancement and applications of AI in recruitment have only just kicked off. So with 2018 only just warming up, we thought we’d help you remain on-trend when it comes to AI in recruitment. Here are 5 fascinating uses of AI in recruitment we believe we’ll see a lot more of in the new year. Why don't you subscribe to our weekly content digest and stay up-to-date on everything HR-Tech related? It's free! If there’s one thing various HR tech experts agree on for 2018, it’s the use of AI-powered assistants – also known as chatbots – in various parts of HR. Jeanne Meister for instance names recruiting, employee service, employee development, and coaching as fields that will be affected by the use of chatbots in her article The Future of Work: How Artificial Intelligence Will Transform the Employee Experience. Many companies use chatbots as an initial way to engage with visitors on their website. Surely you’ve seen those messages popping up saying something like ‘Hi there, need help finding what you’re looking for?’ lots of times. 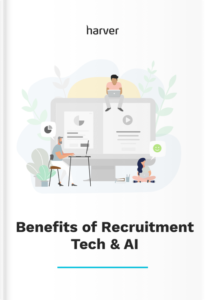 In recruitment, AI-powered assistants can – among other things – help to reduce time to hire and increase the number of candidates who complete the application process. Mya automates tedious parts of the recruitment process such as sourcing, screening and scheduling. She is powered by machine learning and uses natural language processing (NLP) to pick up on details that come up in a conversation. Mya also creates candidate profiles and shortlists applicants. In other words: she promises to be the answer to all your procedural hassle. Chatbot Olivia engages with candidates via the web, various mobile platforms and/or social channels. Just like her sister Mya, Olivia uses natural language processing and she also handles the scheduling part of the recruitment process. Besides saving recruiters and hiring managers heaps of time, the use of chatbots like Mya and Olivia has another advantage. It has a positive effect on your candidate experience. Why? Because these AI-powered assistants make sure applicants get regular updates about the status of their application, give feedback, and are always available to answer questions. In line with the above, Beamery focuses on treating candidates like customers. The company’s candidate relationship platform ‘proactively builds relationships with passive candidates, reduces hiring cycles and creates a single source of truth for all your hiring data’. But what does that mean, to ‘proactively build relationships with passive candidates’? It means that the AI and machine learning elements of the platform identify so-called priority (passive) candidates and better yet, even suggest what times best to reach out to those candidates. Beamery is a good example of how a company is using AI in recruitment to create better, more human relationships with candidates and to truly treat them like customers. In a world where the competition for the best talent is fierce, you want to leave as little as possible to chance. Starting with the job adverts you put online. Often overlooked, it’s with the job ad that an applicant’s journey begins. It’s likely to be the first thing they actually see from your company. So it better be bloody good, right? Data and predictive analytics! Texio analyzes meaningful language patterns that cause some posts so succeed where others don’t. As the number of analyzed documents increases so does the accuracy of the predictions. Moving ever closer to that perfect job advert. Video interviews are rapidly becoming an integrated part of (mobile) recruiting. Not only do they save recruiters and hiring managers a lot of time, they also allow them to get a feel for someone’s energy, the way they present themselves and a more tangible overall impression. But developments of AI in recruitment are now taking things a little further. Let’s see what that means exactly. The company uses machine learning to verify the applicants’ video interviews and see if there is any type of strange behavior going on. This means the system can detect if the candidate is regularly looking away from the screen – which may indicate the use of cue cards – or if there is another voice on the recording – which may indicate that the applicant has a friend on the phone for help. Bias is a big theme in the field of recruitment. And whether you like it or not, we all are biased to some extent. But when it comes to recruiting the best possible candidate for the job, we don’t want our judgment to be clouded by our own bias. Luckily there are some fascinating applications of AI in recruitment that help reduce bias. We already mentioned Textio above, to minimize bias in job posts, but there are more and more companies working towards a bias-free recruitment process. At Harver, we use data and predictive analytics to make predictions on an applicant’s likelihood to succeed in the role he or she is applying for. Based on criteria that are specific to the job and others that are linked to a company’s cultural requirements, algorithms calculate a matching score for every candidate. With as much as 66% of millennials considering to leave their current jobs by 2020 – according to a 2017 Glassdoor report – an AI recruitment tool using predictive analytics to recommend candidates may be just what the doctor ordered for many companies that struggle with unwanted turnover. Neelie Verlinden is the Co-Founder and Editor-in-Chief of Digital HR Tech. She’s an experienced digital HR & HR Tech writer, speaker, and entrepreneur with an international background. She has written countless articles on all things HR technology.